Sasuke Furuta, aesthete, and ambitious man. Huzzah’s recent release of a subtitled version of episode 6 of Hyouge Mono is very welcome indeed. It transports us back to 1582, and the struggle for Japanese unification under Lord Oda Nobunaga. This episode principally concerns itself with Sasuke, his realization that the window of opportunity is closing, and his desperate attempts to raise his stature. Sasuke is awed by the splendor of the "Imperial Veneration" room at Lord Nobunaga's residence. 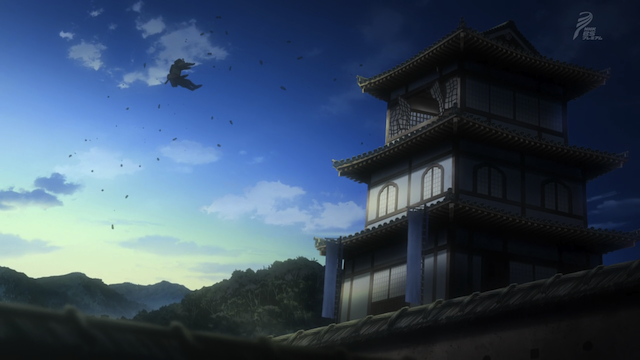 As the episode begins, Sasuke and others have assembled at Lord Nobunaga’s residence on New Year’s Day. They are shown the splendid “Imperial Veneration” room, which has been richly decorated in anticipation of a time when the Emperor might wish to visit. Sasuke realizes that such a visit would signal the end to the age of opportunity, as it would mean that Nobunaga has solidified his power. Sasuke, an ambitious man hopes to take advantage of any remaining opportunities to achieve glory, as this is the only path toward raising his stature to that of a lord. Sasuke is motivated to take on all the tough assignments. As a result, Sasuke seeks out the difficult assignments, the ones that will curry favor with his superiors. 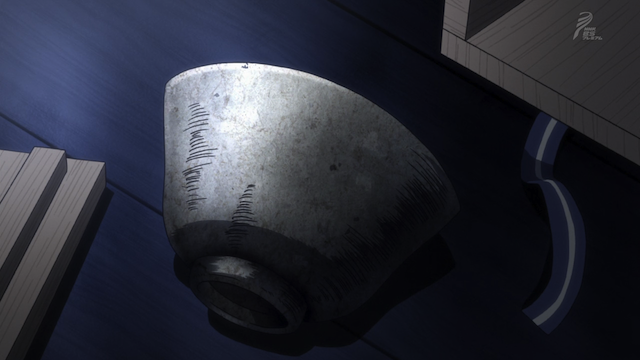 In addition to courage, Sasuke uses cunning, some counterfeit ceramics, and his capacity as an aesthete to persuade his lord’s opponents to surrender or flee. Having had some success, Sasuke presses his luck. 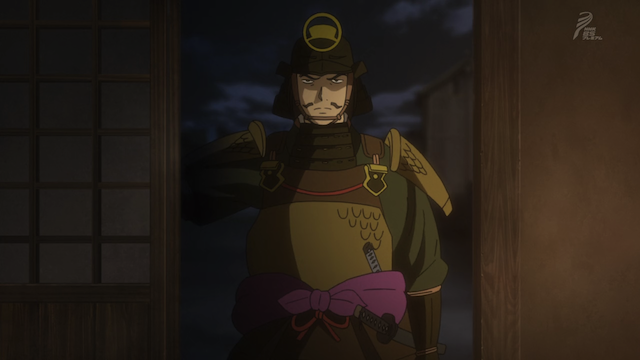 He begs Oda Nobutada (Nobunaga’s eldest son, and designated heir) to be allowed to try another diplomatic mission into the stronghold of Morinobu Nishina, after the previous emissary returns with his nose cut off. The final portion of the episode is structured a little like the pagoda in Bruce Lee’s Game of Death. Sasuke overcomes a foe, and climbs a staircase, only to encounter another. 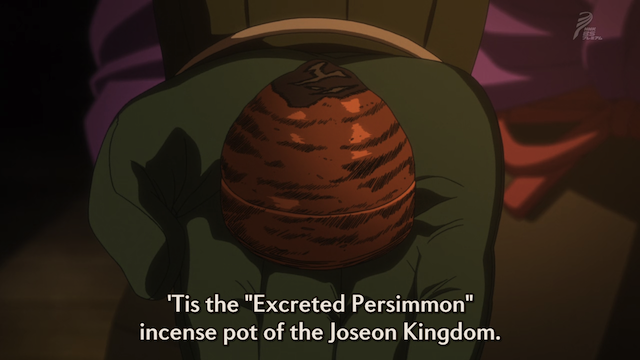 The first guard accepts the "excreted persimmon" as real, and flees the castle. "It's beauty carries even the weight of a false account". Unfortunately this one fails to deceive a more discerning eye. "Both the essential shagreen base and imprinting are absent". A female warrior with an eye for ceramics who longs for sensual pleasure. When his counterfeit ceramics fail to persuade a female warrior, Sasuke is forced to personally provide something more compelling. This takes a bit longer, but, as the dawn approaches (and with it the attack by Nobutada’s forces), Sasuke has convinced her that there are still things worth living for. Thus the final staircase is cleared and Sasuke ascends to meet Morinobu Nishina. Sasuke is taken by surprise and literally KICKED out of the building. If you look carefully, you can actually see the imprint of Morinobu Nishina's shoe on Sasuke's chest. Poor Sasuke! After all that work, he isn’t successful. 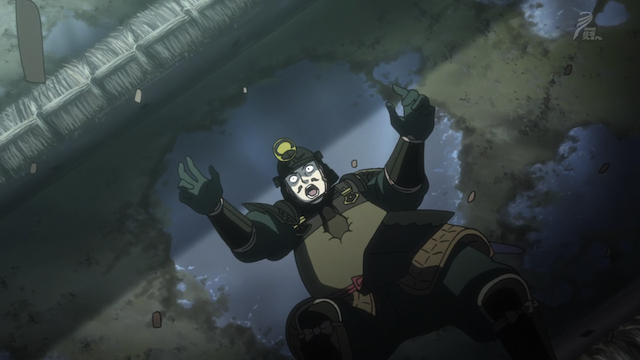 I expect the next episode to return to this battle as, prior to his committing seppuku, Morinobu Nishina famously predicted Oda Nobunaga’s imminent death. It was great to see the return of Hyouge Mono. The political intrigues are swirling, and the tea is being poured. 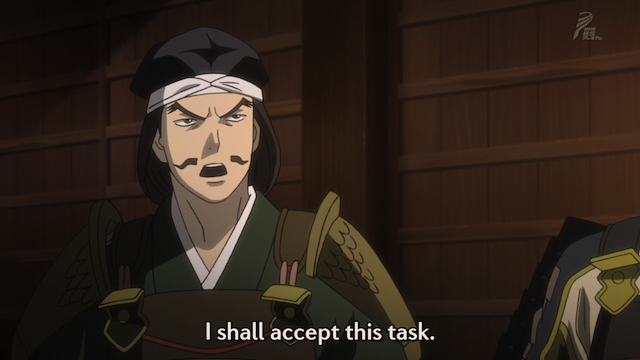 I really enjoy each one of these episodes, and hope that Huzzah has the stamina to continue producing translations. 16 additional episodes are already available raw, and the show is slated to run through the Fall season. Haha, I never thought of it like that. I wonder if that’s what actually happened, though – I find it unlikely that level-like ‘journeys’ happen in real life. There’s a lot more action this episode – it certainly felt more intense than last episode. I especially like Furuta’s interesting persuasive techniques – though they’re not much different from modern techniques, his use of them certainly is more refined and precise. Anyways, this battle also had Oda successfully use guns against the Takeda, right? I think you are thinking of a different battle. The one you are talking about (if I am correct) was waged by Nobunaga Oda, Nobutada’s father, in 1575. 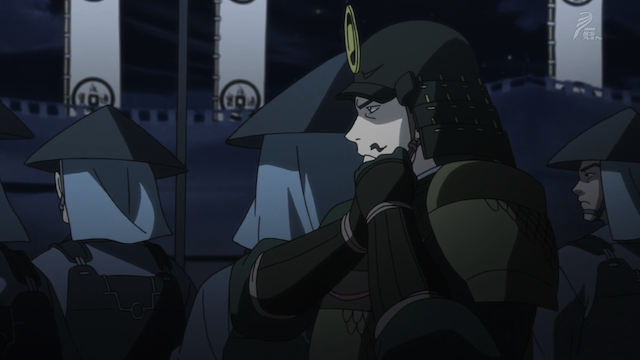 The battle in this episode is led by Nobutada Oda in 1582. This episode did have a lot more action. 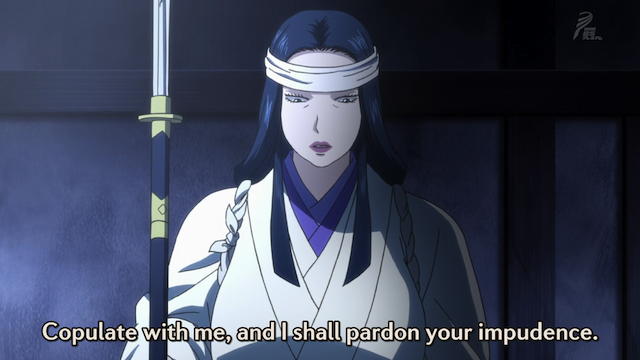 I really like the direction that Furuta’s character has gone, as well. It is pretty complex. He isn’t just ogling great works of art, he actually steals and/or counterfeits them. He wants to be a lord, so he acts somewhat recklessly, to attain honor, but his actual activities include bribery and lying. I guess that may have been the sentiments at the time? 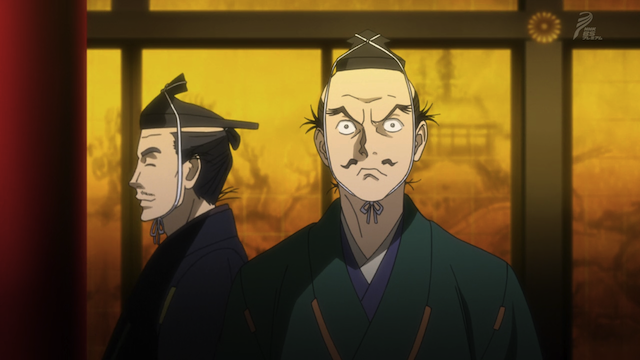 The producers of this anime must have some really good cultural and history advisers, to be able to construct a story that really is just a retelling of history. I wonder if anything’s made up? “Nobu-sons” — I’m lucky I wasn’t drinking anything when I read that. I feel like I narrowly missed having milk come out of my nose. I’m guessing they made some details up, but the way they worked it into the real history is VERY impressive.